Let’s be brutally honest. Thinning tresses are, well, not particularly desirable. And let’s face it, we gals are pretty obsessive when it comes to our hair – from shampoos that promise to thicken our locks to mousses that provide major volume to serums that promote major shine. We want our manes to be thick and healthy. Unfortunately for some of us as we get older, we experience limp, lifeless locks that shed faster than a Persian cat’s. Now, if you follow this blog regularly, you know I’m a sucker for cutting-edge beauty goods and product-firsts that change the game in their space. My newest game-changer discovery? Hair Vitality Complex. Product 411: Two words: copper peptides. Copper peptides exist naturally in our tissues but unfortunately decrease by 60% between the ages of 20 and 60. Why are these peptides important? They work on hair follicles in two ways: by increasing follicle cell proliferation and follicle size, and decreasing programmed follicle cell death. The proprietary copper peptide complex is the magic behind the serum’s effectiveness. The serum is $49 per bottle and should last two – three months. Why it’s worthy: If you’ve noticed your tresses seem a lot sparser lately, or you simply want to be proactive in maintaining thick, healthy hair, Hair Vitality Complex is a smart and proactive solution. Hey, we spend gobs of time and money on our skincare products. Don’t our locks deserve the same TLC? 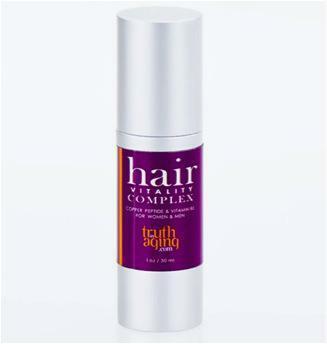 You can get this locks-building complex directly from truthinaging.com or via Amazon.com.